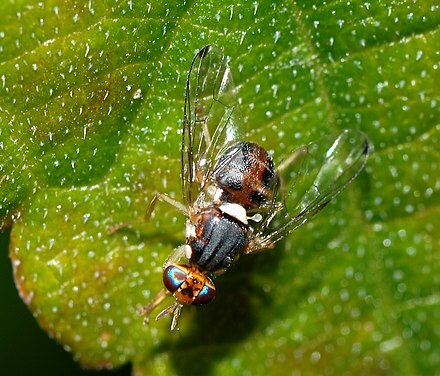 Tephritidae are sometimes called peacock flies, in reference to their elaborate and colorful markings. The name comes from the Greek τεφρος, tephros, meaning "ash grey". They are found in all the ecozones. Conopidae in Bei-Bienko, G. Ya, 1988 Keys to the insects of the European Part of the USSR Volume 5 (Diptera) Part 2 English edition. Keys to Palaearctic species but now needs revision. Fly (Diptera: Tephritidae) Phylogeny". The Diptera Site. Agricultural Research Service. Archived from the original on July 9, 2010. Retrieved July 31, 2010. Wikimedia Commons has media related to Tephritidae. The Diptera site Comprehensive guide to identification literature with a worldwide perspective.